VIBRASTRAIT has high-quality tourmaline ceramic plates which leave your hair shiny and frizz free. Babyliss Pro has a sleek design and a soft metallic-toned housing able to withstand ultra-high temperatures. Its ergonomic design makes it comfortable to hold Babyliss for longer hours. When you use VIBRASTRAIT / BABYLISS PRO, your hair won’t suffer any damage.It will actually become smoother and straighter. Both models are ideal for Thick curly coarse hair. Both models have extra long swivel cords – so you won’t get any interruptions when straightening your hair. Very easy to use. You don’t need a user manual to learn how to use either models. Heat is even;y distributed through plates thus offer you with uniform results. These two models feature different heat plates. Babyliss Pro has a Titanium plate while VIBRASTRAIT has tourmaline plates which detangle hair and make it straight in a single pass. Both are light weight, durable and premium hair straighteners – highly rated by customers on Amazon. If you can’t afford VIBRASTRAIT PRO & BaBylissPRO Nano Titanium-Plated , I suggest you opt for HSI Professional Digital Ceramic Tourmaline Ionic Hair Straightener. It is an affordable hair straightener with solid ceramic tourmaline plates and advanced infrared technology to heat-up your hair, make it straight without damaging it. Its round body shape design makes it easy to flip when styling your hair. On the other hand, you need to press the power button for about 3 seconds for it to power on & heat – up (I guess that is a CON). (1)Wide High quality tourmaline ceramic plates – heat up so fast and they cover a big surface area thus offer you with quick results. (2) Auto shutoff after 50 minutes – this is a safety feature (it saves you from getting burnt), Easy to operate,(3) LED temperature display (190°F-450°F) – You can easily know the temperature on the plates, (4) The vibrating technology (7500 oscillations per minute) enables the hair straightener to glide through hair very fast without pulling it – you can easily switch of the Vibration function with a button. (5) 8-second rapid heat-up (you don’t have to wait for so long to start straightening / ironing your hair), (6) It locks in moisture for a frizz-free hair – also leaves your hair smooth & shinning, (7) Even heat distribution – guarantying you with perfect results, (8) Get saloon level results at a small cost. (9) Extra-Long Swivel Cord, (10) Variable temperature settings allow you to control the functionality of this hot tool. Xtava Pro-Satin Infrared Straightener Professional Flat Iron – Check price on Amazon – WHAT WE LIKE:- (1) Affordable Infrared Flat Iron, (2) Dual Voltage Hair Straightener (you cab use it from any part of the world), (3) Wide ceramic plates – cover a wide surface area, (4) Temperature control function gives you the opportunity to set the right temperature for your hair type thus prevent damage, (5) Auto Shut off function works as a security feature. KIPOZI 1 Inch Pro Nano-Titanium Flat Iron – Check price on Amazon – WHAT WE LIKE:- (1) 2 in 1 Salon Tool – It can be used as a flat iron or curling iron, (2) Dual Voltage Nano-Titanium Flat Iron ( compatible with 100V-240V), (3) Anti Frizz LCD Hair Straightener, 450 F Saloon grade high heat – ideal for thick hair, Great price, (4) Contoured Floating Plates will glide through your hair smoothly without pulling or braking your hair, (5) Sliding lock makes it easy to store this hair styling tool, (6) It turns on & off so fast, (7) Excellent performance – it straightens hair like a charm. How Do You Use a Hair Straightener? Start by washing your hair; it is never advisable to style your hair when it is dirty and the same goes for hair straightening, you need to work on your hair when it is thoroughly clean. Use your favorite shampoo and don’t forget to wash with conditioner after shampooing the hair as it will help to make your hair really soft. Apply a heat protectant product and dry the hair; your hair is about to go through some serious heat styling therefore it is important to protect it from the heat damage by applying a heat protecting product. Thereafter you can go on and start drying your hair with the help of a blow dryer. In the process of drying your hair, it will even become softer. Section up your hair; You obviously can’t straighten your hair in one go so you will have to make it easily manageable by diving it up into different sections using puff holder or rubber bands so that hair remains held up. It is best to separate it into three or four sections depending on how thick your hair is. The essence of sectioning is to ensure that not even a single hair strand is missed out thus helping you achieve excellent results. At this point you are ready to plug the hair straightener in so that it heats up. Always ensure that your hair is completely dry before straightening; wet hair is extremely delicate and the straightener can be extremely disastrous when used on wet hair so never by any chance use the tool on your hair before it dries up completely. Either air dry or use a blow dryer to ensure that your hair is completely free of moisture before your straighten. How To Straighten Hair At Home? Wash and condition with straightening shampoo and conditioner; look out for shampoo that is meant for straightening hair and after wash the hair with conditioner so that you add moisture that has been washed out by shampoo. Remove most of the moisture with a towel; from the shower, grab a soft clean towel to gently pat your hair dry until most of the moisture is out, go section by section ensuring that you don’t rub the towel against your hair as it can result into hair breakage. Simply pat your hair with the towel until it is completely dry. Add heat protection spray before your hair dries completely; before you go on to dry your hair completely you should first of all smear some heat protection serum on your hair reason being the serum will infuse well into the hair when it is still wet. Also use a wide toothed comb to spread the serum evenly all through your hair for excellent results. Dry your hair with a blow dryer; straightening is much simpler and less harmful when the hair is totally dry which means you must use your blow drying skills to get the hair completely dry before you go ahead to use the straightening tool. Set your blow dryer to low heat and begin drying hair while making the blow dryer’s nozzle face downwards to the roots for it to dry well without getting frizzy. Plug the straightener in and switch it on; plug the straightener into the socket, press its start button to turn it on and select low setting if you have thin hair or to medium heat setting if your hair is really thick. After selecting the setting you want to use, leave the straightener to heat up. Divide hair up into different sections; when hair is thinner it can easily pass through the straightener and you are less likely to leave parts of your hair not worked on therefore it is very much recommended for your to divide the hair before straightening. Clip hair up and begin from the back of the head, moving upwards to the upper sections until you get to the front part to finish up the whole head. Put the straightener just about an inch from the roots; to avoid burning your scalp you should place the straightener not less than an inch away from the roots. If you place it too close it will definitely end up burning you. Clamp hair into the straightener; grab a part of the hair from the first section and clamp it into the straightener then gently pull the tool towards the roots going all the way down to the very end of that strand that you are working on. Don’t go over the same area several times and endeavor not to use too much energy as you work reason being heat styling is already tough on your hair and using a lot of energy will damage the hair even more. Repeat procedure on each section; for every section, repeat the same procedure as explained in the previous point until all your hair is now straight. Spray to add shine; you will want to maintain your gorgeous look all day so apply just a reasonable amount of your favorite hair spray to make hair shiny and keep your look in place all day. With its really sleek design and a very wide variety of temperature settings to choose from the BaBylissPRO Nano Titanium-Plated Ultra-Thin Straightening Iron will make straightening your hair easier than you ever thought. This straightening iron is designed with extra thin plates made from nano titanium, one of the most excellent heat conductors. With this, the tool delivers faster and more amazing results since its plates provide and sustain high temperature throughout the straightening process. With these nano titanium plates, the iron produces infrared heat that gently infuses into the hair’s inside to minimize damage. Its thin and lightweight design together with extra long plates ensure that you don’t spend too much time straightening your hair, its slim body fits well in your hands, its long plates cover a wider area while the lightweight allows you to work without your hands getting exhausted. The BaBylissPRO Nano Titanium-Plated Ultra-Thin Straightening Iron offers very many heat settings going all the way to 450F to ensure that all your hair needs are perfectly suited whether you have thick, fine or thin hair. And last but not least, the straightening iron is enclosed in Ryton housing which is tough enough to endure even the highest heat. 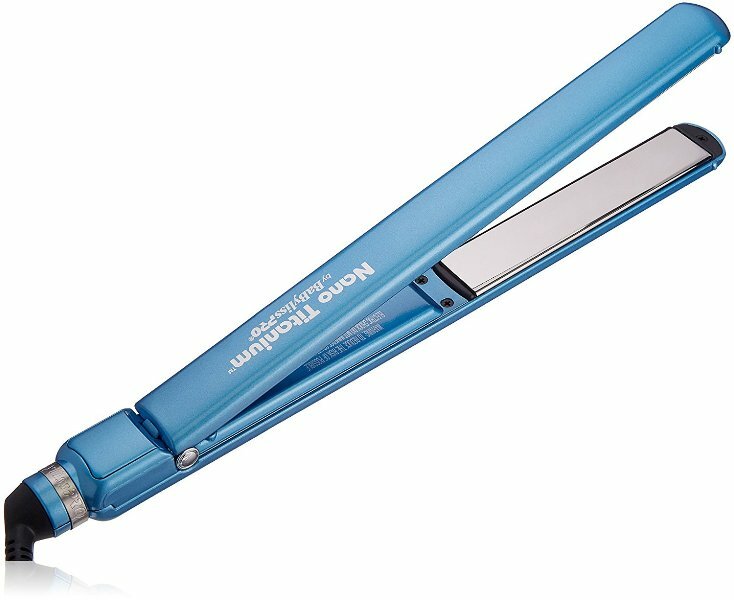 High heat resistant exterior; the BaBylissPRO Nano Titanium-Plated Ultra-Thin Straightening Iron is constructed with Ryton housing which resists heat even when it is too high. This simply means that you will able to straighten your hair with peace of mind as you will not be worried about the iron’s exterior burning your hands. This makes the straightening iron a lot different from the traditional ones where you would have to be extra careful to prevent the iron from accidentally burning your hands or even your scalp. It is only the plates that get heated but not the iron’s housing. Extremely easy to use; with its slim and ultra thin design plus its lightweight, the BaBylissPRO Nano Titanium-Plated Straightening Iron is extremely easy to use. This iron fits perfectly in your hands which gives you the flexibility to reach well to different parts of head to work on the hair with very little effort. It also has a very light weight so even if you have very thick hair that takes longer to get done with, your hands will not get too warn out like they would if you were using a heavy straightening iron. There is nothing as amazing as having a tool that is super easy to use. Sturdy construction; BaBylissPRO Nano Titanium-Plated Ultra-Thin Straightening Iron has been constructed only with high quality materials to ensure that it doesn’t easily get damaged. It is a very sturdy iron that will last for years and years therefore as you pay for it keep in mind that you are going to get real value for your money. It is not one of those irons that will get broken or damaged the first time they fall down. Wide variety of heat settings; your hair type or texture is not an issue when you have a high quality straightening iron like the BaBylissPRO Nano Titanium-Plated Ultra-Thin Straightening Iron. It offers a really wise range of temperature settings, so you have the chance that heat setting that you feel works best for your hair. For those with thin and weak hair choose the lowest heat setting, those with normal hair can use medium heat while those with very thick and coarse hair use high temperature settings. Everyone’s hair needs will be fully catered for by this iron. Covers wider sections of hair; another outstanding reason you will love the BaBylissPRO Nano Titanium-Plated Ultra-Thin Straightening Iron is its extremely long 5 inch plates. These long plates not only go through hair without tagging and pulling but also cover wider sections of the hair so you will end up spending less time on straightening your hair than you would have. Misses the auto turn off feature; while other high quality straightening irons have advanced technology that enables them to automatically shut off when not in use, the BaBylissPRO Nano Titanium-Plated Ultra-Thin Straightening Iron misses out on this function. You therefore have to be very alert all the time to ensure that you don’t forget to turn off the iron manually whenever you finish using it. The VIBRAstrait Oscillating Flat Iron is another high quality straightening iron that will put a smile on your face. This is a very rare straightening iron featuring an exceptional blend of heat and vibration technology to give you the best hair straightening results. This iron’s plates produce 7500 vibrations in each and every minute in order to mix more hair strands into the iron in each pass that you make and thus you will not have to hurt your hair or waste more time making so many passes before all your hair has been straightened out. Additionally it comes with the best quality ceramic tourmaline plates to reduce damages caused to dry hair by heat and locks moisture into the hair without making it frizz. This is the straightening for people who are always in a rush reason being it rapidly heats up in just about 8 seconds and automatically shuts off after about 50minutes in case you forget to turn it off when you finish up working on your hair. It doesn’t really matter which hair type you have, you will still enjoy this high quality straightening iron since it offers variable temperature settings to work well with just any hair type. Straightens with completely no damage; the reason some people restrain from straightening hair is because of the fear of straightening irons damaging their hair but that is no more because here is a very good quality straightener that will make your sleek straight without causing it any sort of damage. 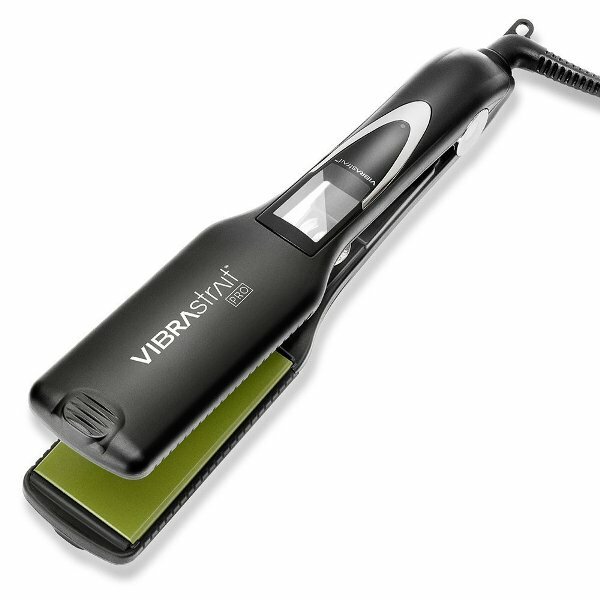 The VIBRAstrait Oscillating Flat Iron features ceramic plates coated with tourmaline that produces negative ions which neutralize positive ions to leave the hair found in damaged and dry hair. The heat produced by this iron locks moisture into each hair strand leaving you with shiny, silky and very smooth straight hair. So as you make this change to straight hair, you will never get worried about the tool hurting it. Even heat distribution; with the VIBRAstrait Oscillating Flat Iron you will be assured of getting nothing but the most amazing results all through reason being this flat iron has a very incredible way of evenly distributing heat all through the plates so that you receive the best results on each part of the hair that you work on. And with its swivel 360 degree cord which gives you the flexibility you need to reach out to any part of the head so that you can achieve the same great results every other time. 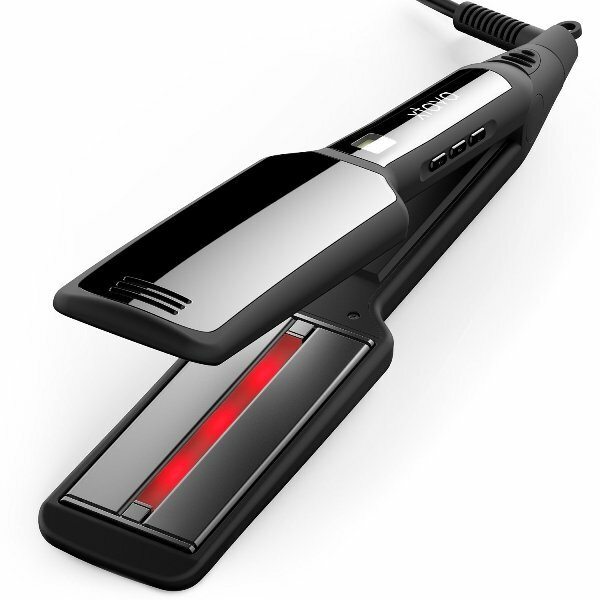 Even heat distribution is one of the reasons as to why this flat iron is highly reliable. Vibrating technology; this is not common with many straightening irons not even the ones that are included on this list so this is a feature you must impatiently look out for. The VIBRAstrait Oscillating Flat Iron produces 7,500 oscillations in each and every minute to mix more hair strands into the iron’s plates so that you work on more strands in fewer passes. This also helps to reduce the harmful effects of heat styling simply because when you make fewer passes and you don’t go over the hair so many times you highly reduce the damage the flat iron would have caused to your hair. Automatic shut off; for those of you who tend to easily forget it is important that you buy a straightening iron like the VIBRAstrait Oscillating Flat Iron which has an automatic shut off feature to avoid any accidents. This feature turns the flat iron off after some minutes of not being used. It comes at a high price; well we all understand that high quality products come with a price but this is not being fair to the low income earners that would love to also try out something of good quality at an affordable price. Not everyone is ready to pay such a price for a mere hair straightener, if you want something cheap, this is not the hair straightening tool you are looking for. Even with those thick natural curls that seem really difficult to straighten the Xtava Pro-Satin Infrared Straightener is the tool you need in your home. This incredible hair straightener features two inch wide ceramic tourmaline plates which are very much recommended for taming even the thickest hair types together with upper dual plate technology which helps to sustain even heating all through styling process. What makes this straightener so unique from all the rest is its infrared heat technology which ensures deep penetration of heat through the hair cuticle to straighten hair without it running too dry but rather giving that shiny and sleek appearance that you love so much. The Xtava Pro-Satin Infrared Straightener offers as many as 10 various temperature settings to ensure that it performs excellently and precisely according to your hair needs, this means that it can be used on delicate and fine hair types, normal hair types as well as even coarse thick hair types. In addition, it is also designed with rapid heat up technology that enables the straightener to heat up with in just 90 seconds and an auto shut off function that automatically switches the straightener off after 60 minutes of not being used. There is a lot more that this straightener can do that will make you fall in love with it. Advanced temperature control; temperature control is one of the most important factors for achieving great hair straightening results and this Xtava Pro-Satin Infrared Straightener gives just what you are looking for. All of its heat settings are very accurate and precise thanks to the advanced microprocessor so it is all up to you to choose that temperature setting that you feel works best for your hair, starting from 265F to 445F. These settings are well displayed on its LCD for you to always be sure that you are using the exact heat setting you intended to use. Infrared heat technology; the Xtava Pro-Satin Infrared Straightener’s plates are infused with infrared technology to ensure that heat dissolves well into each hair cuticle, this way moisture is locked in, there is less damage caused to the hair and it doesn’t cause frizz at any one moment. 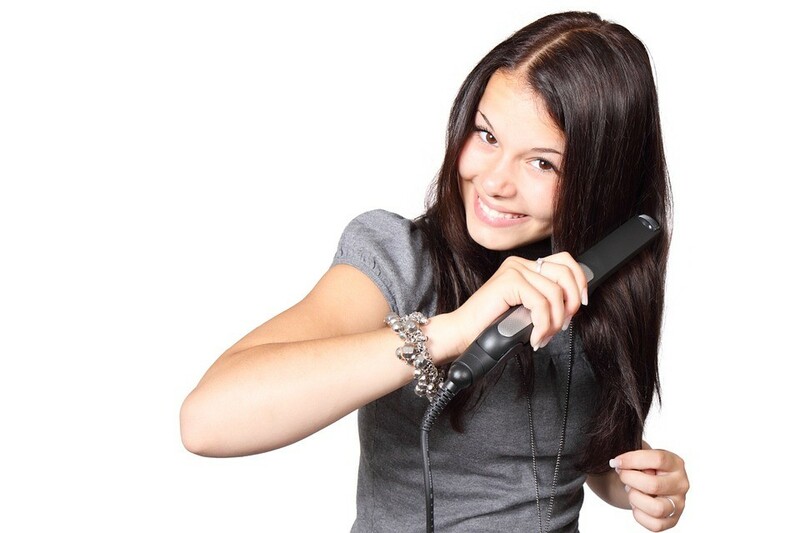 With this technology the straightening iron will help you to get your hair straight in the healthiest way possible. Smart and intuitive design; the Xtava Pro-Satin Infrared Straightener was constructed with a lot of intelligence and this is why it features on this well selected list of the best hair straighteners. There is no doubt that you will fall in love with its really smart and intuitive design, the straightening iron comes locked which means all through transportation its plates will be well protected from accidental heating and to make using the tool easy, you just have to pull the lock button and it will be unlocked and ready for you to get started. Its ergonomically designed handle allows you to work your straightening iron in the best possible way. Automatically shuts off; when you are in a rush and you forget to turn the straightening iron off by yourself there will be no need to worry because after about 60 minutes without anyone using it, it automatically switches itself off. This greatly helps to cut down on power bills and also reduce accidents that can result from overheated electric appliances. Long and flexible cord; this Pro satin has a very long cord measuring about 8 feet but that’s not all, this cord is also super flexible. It can swivel all the way to 360 degrees making it super easy for you to work on all sides of the head. You will find no difficulty in using this amazing hair straightener. Doesn’t come with a user manual; the only problem that I discovered about the Xtava Pro-Satin Infrared Straightener is the fact that it doesn’t come with a manual. This might not seem like a big deal for some people who are already experienced with using straightening irons. However those that will be using a straightening iron for the first it becomes quite hard. Anyone would expect such a high quality tool to come with a manual entailing all necessary information about how to use the straightener. There is something about straight hair that keeps it trendy over the years yet other styles come and go so for all the ladies that want to maintain their straight hair or those that feel like joining this forever trendy look, the HSI Professional Digital Ceramic Tourmaline Ionic Flat Iron Hair Straightener is here for you. It is designed with ionic ceramic tourmaline plates detailed with 8 heat balance micro sensors which evenly distribute heat and control the temperature to ensure that you can make hair straight within only a few passes, this flat iron gets your hair sleek, silky and leaves it shiny without causing it any damage whatsoever. Furthermore the plates are coated with tourmaline which is responsible for producing negative ions when the flat iron heats up, these negative ions don’t let the hair cuticle open in order to lock moisture in and give you that long lasting, smooth and very attractive look. There is no need to get all frustrated as you wait for the HSI Professional flat iron to heat up reason being it heats up in just seconds, therefore you will be able to use it in only a flash of time. You can adjust to any temperature that you feel is appropriate for your hair type and texture selecting from its temperature settings that range from 170-450F. This flat iron’s plated are ergonomically curved for added flexibility and ease as you get you get your hair straight. 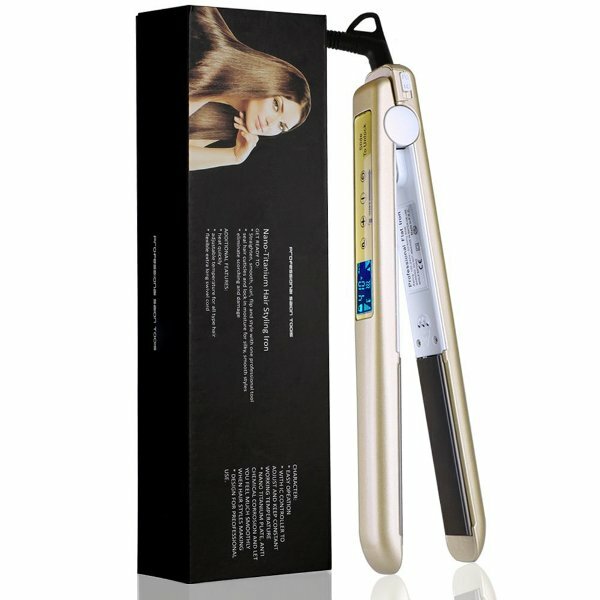 Highly recommended for fine hair; yes the HSI Professional Digital Ceramic Tourmaline Ionic Flat Iron Hair Straightener has the variable temperature settings to suit different hair types including thin and thick coarse types but those with fine hair seem to get more outstanding results from this straightener. Its plates glide through fine hair strands without tugging and pulling hair thus offering you a very efficient and at the same time very comfortable straightening session. 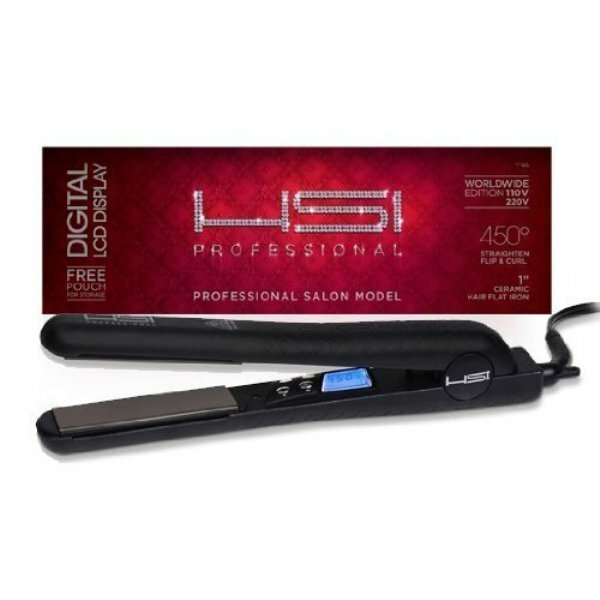 Comes with several accessories; when you purchase the HSI Professional Digital Ceramic Tourmaline Ionic Flat Iron, you will not only receive the straightener, it comes along with other items that you will also love. Unlike other flat irons, this one comes with a pair of gloves in case you are afraid of using bare hands to straighten your hair, it comes with a travel bag to make travelling easier for those who are always on the move so you don’t have to leave your straightener behind and a 5ml Argan oil leave in conditioner that is very good for your hair. Heats up in just a flash of time; all that frustration of having to wait for the straightener to heat up for a long period of time has come to an end with this HSI Professional flat iron. It is constructed with the ability to heat up in only a matter of seconds, you will close your eyes and open when the iron is more than ready for you to get working already. By the time you finish sectioning up your hair and the rest of your preparations, your flat iron will have heated up already. Consistent heat output; form the beginning to the end of the session, HIS professional flat iron’s heat output is consistent just to make sure that you have the same great results all over. This is as a result of the tourmaline coated plates that it has which deliver necessary temperature without causing any kind of damage to your hair. This flat iron improves the state of dry and damages hair. Difficult to start and doesn’t maintain high heat efficiently; for you to turn this straightening iron on you will need to firmly hold the power button for a few seconds which makes it difficult for some people to master the trick unlike other models where just one single touch is enough to switch the iron on. And in addition to the tricky start up, it also has issues sustaining heat especially on the high heat settings. When you have just began your straightening session, this straightening iron starts at a high speed but it doesn’t maintain the heat to the end of the session which leads to ineffectiveness. And now for my ladies who are not only looking for a straightener with exceptional straightening performance but also one that will get people’s attention then look out for the KIPOZI 1 Inch Pro Nano-Titanium Hair Straightener. This super stylish flat iron features nicely contoured nano titanium floating plates that smoothly slide through your hair to deliver excellent results without damaging your hair because they don’t tag or pull your hair. But what we love even more about the straightener is its amazing display with a touch screen where you only need to swipe a finger to unlock the iron and get started on straightening your hair. It also doesn’t miss out on the auto shut off feature therefore just in case you forget to turn it off, you don’t have to worry as the tool has ability to turn itself off. With the KIPOZI 1 Inch Pro Nano-Titanium Hair Straightener’s 360 degree swivel cord, you will have the flexibility to work around all sides of your head with less difficulty. Incredible flexibility; the KIPOZI 1 Inch Pro Nano-Titanium Hair Straightener has several features that you will love but its flexibility is at a whole new level. It has a 360 degree swivel cord for you to change the straightener to any direction of your choice with ease, with a tool that is as flexible as this you will even spend less time styling since it makes everything very simple for you. Very simple operation; this is possibly the easiest flat iron to operate, there are no numerous control buttons to select from and to unlock you simply have to swipe on the screen with your finger and you will be good to go. On its smart sensor screen the temperature setting you are working with are well displayed for you to be sure that you are using the right heat setting for your hair type. The controls are well labeled in case you want to increase or reduce the temperature, generally even if you are a first time user your will enjoy styling your hair with this advanced hair straightener. Perfectly designed for smooth styling; the KIPOZI 1 Inch Pro Nano-Titanium Hair Straightener is constructed with contoured floating plates which smoothly slide through your hair without pulling or tugging giving you the most comfortable styling session ever. Remember that heat styling is already tough on your hair so it is very important that you work with a very good straightening iron that will not make the damage even worse. Money back guarantee; this is what high quality products offer, the makers of this straightening iron are so sure about its quality that is why it is backed up by money back guarantee, in case you receive your straightening iron and you are not pleased with it you can always feel free to return it and have your money given back. Stylish and comes at an amazing price; the stylish iron is offered at very affordable price, on first sight the first thing that will come to your mind is that this straighter must be highly priced however that is not the case. This iron is offered at a very friendly price you will not find any hardship paying for it. It is extremely fragile; many will love the KIPOZI 1 Inch Pro Nano-Titanium Hair Straightener because of its stylish appearance since it has the touch screen display that many other straightening irons don’t have but this is also this tool’s biggest disadvantage. It is extremely fragile which means you have to be super careful with it all the time and I mean all the time. If it slips through your hands and falls there are high chances that it will easily get damaged and if you are not lucky enough it might even stop working for good. Takes quite long to heat up; we have already looked at straightening irons that heat up in only about 8 or 9 seconds but this takes up to 30 seconds before it heats up really well. This marks the end of this detailed review on the ‘’Best Flat Iron Hair Straighteners – 2019 Bookmark this post for future reference.